An overview of the main job responsibilities of a CFO. 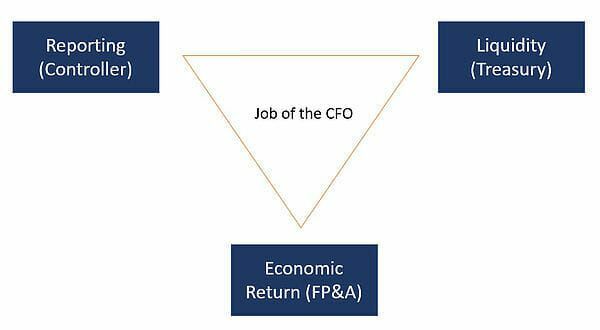 What is the main job of the CFO? Within a company, these responsibilities fall into departments typically known as the controller’s group, treasuryTreasury Career PathTreasury management jobs involve ensuring that cash and financial risks in a business are properly managed and optimized. The main priority is to ensure cash is managed for day-to-day business operations while having an outlook for long-term strategy. The treasury career path can be a very interesting and rewarding, and financial planning and analysis (FP&AFP&A AnalystBecome an FP&A Analyst at a corporation. We outline the salary, skills, personality, and training you need for FP&A jobs and a successful finance career. FP&A analysts, managers, and directors are responsible for providing executives with the analysis, information they need to make operational, strategic decisions). As we outlined above, the job of the CFO falls into three main categories, which are broken down in further detail below as we attempt to outline for you, “What does a CFO do?”. To learn more about progressions across a wide range of corporate finance careers, check out our interactive career map. Reporting takes up a lot of a CFO’s time, and this responsibility typically resides in the Controller’s group. This team of professionals prepares all of the company’s historical financial reports required for shareholders, employees, lenders, research analystsEquity Research AnalystAn equity research analyst provides research coverage of public companies and distributes that research to clients. We cover analyst salary, job description, governments, and regulatory bodies. This group is responsible for ensuring all reporting is prepared in an accurate and timely manner. The CFO needs to ensure the company is able to meet its financial commitments and manage cash flow in the most efficient way. These responsibilities are usually carried out by the treasury groupTreasury Career PathTreasury management jobs involve ensuring that cash and financial risks in a business are properly managed and optimized. The main priority is to ensure cash is managed for day-to-day business operations while having an outlook for long-term strategy. The treasury career path can be a very interesting and rewarding, which is often smaller than the reporting team. This group is tasked with managing the company’s cash balance and working capital, such as accounts payable, accounts receivableAccounts ReceivableAccounts Receivable (AR) represents the credit sales of a business, which are not yet fully paid by its customers, a current asset on the balance sheet. Companies allow their clients to pay at a reasonable, extended period of time, provided that the terms are agreed upon., and inventory. They also carry out the issuing of any debt, managing investments, and handle other liquidity-related decisions. The third thing a CFO does is help earn the company earn the highest possible risk-adjusted return on assetsReturn on Assets & ROA FormulaReturn on assets (ROA), a form of return on investment, measures the profitability of a business in relation to its total assets. The ROA formula is used to indicate how well a company is performing by comparing the profit it's generating to the capital it's invested in assets. The higher the return, the more and return on capital (or return on equityReturn on Equity (ROE)Return on Equity (ROE) is a measure of a company’s profitability that takes a company’s annual return (net income) divided by the value of its total shareholders' equity (i.e. 12%). ROE combines the income statement and the balance sheet as the net income or profit is compared to the shareholders’ equity.). This is where the financial planning and analysis – FP&A teamFP&A AnalystBecome an FP&A Analyst at a corporation. We outline the salary, skills, personality, and training you need for FP&A jobs and a successful finance career. FP&A analysts, managers, and directors are responsible for providing executives with the analysis, information they need to make operational, strategic decisions – comes in to help the CFO forecast future cash flow of the business and then compare actual results to what was budgeted. The FP&A team plays a critical role in analytics and decision making in the business. If the company has a corporate developmentCorporate Development Career PathCorporate Development jobs include executing mergers, acquisitions, divestitures & capital raising in-house for a corporation. Corporate development ("corp dev") is responsible for executing mergers, acquisitions, divestitures and capital raising in-house for a corporation. Explore the career path. team, they also play a big part in creating (or attempting to create) optimal investment returns for the business. What else does a CFO do? Surely the above is not all a CFO does. Well, the above is actually quite a lot for a CFO to do, but there are other duties that include leadership, communication with the board, negotiating with suppliers and vendors, and supporting the company’s mission, vision, values, and culture. Other groups that might report to the CFO include supply chain, procurement, information technology (IT), and almost any other department, depending on the organization and the skill set of the CFO.